Bellevue, say hello to the Lakehouse and its sibling bar, Civility and Unrest. The sleek yet homey comfort of the Lakehouse. Located in the new W Bellevue Hotel, the Lakehouse is like walking into your friend’s elegant home—if that home could comfortably seat 150 people. 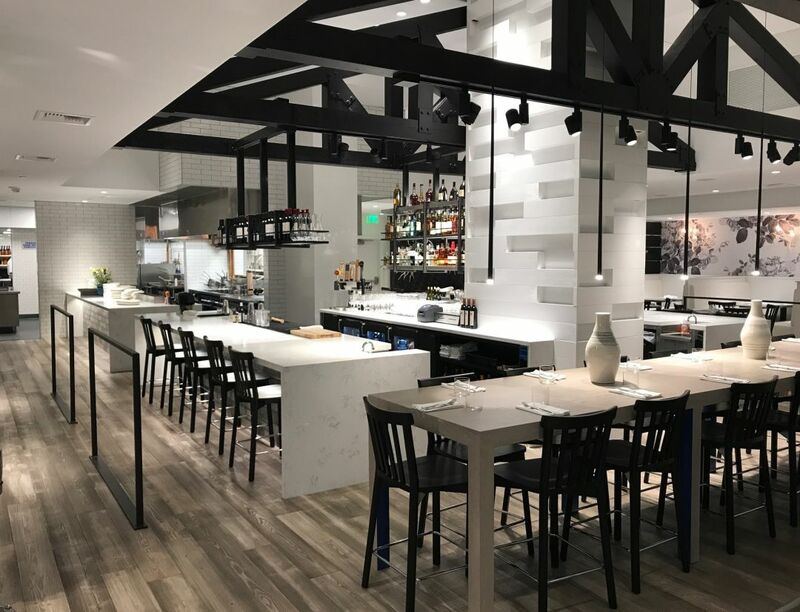 It’s an open space of soft grays, anchored by the central bar; plenty of tables and booths and space for private dining, a potential unofficial spot of hushed conversations about “Barbara’s” casserole. (I joke.) Wilson really has put in the work here, hewing to the lake home theme, there’s adirondack seating in front, walls papered in an antique rose print, cookbooks and handthrown ceramics stacked on shelves, and a small bin of childrens’ toys. Sorry, kids, no iPads, but old-school tin lunch boxes of mini Etch-a-Sketches and Rubik’s cubes. All the dinnerware is handmade stoneware from salt cellars to large oblong platters, upon which shareable portions of whole-roasted halibut or a fan of slice meat or confit chicken will appear alongside sides of slaw or saffron potatoes. Elsewhere on the menu find lots of lush vegetable dishes, like Moraccan-spiced roasted carrots with labne, chiles, almonds, and mint or curry-roasted cauliflower with herby hummus, kale pesto, and preserved lemon. Fresh pasta will also be rolled out on the daily, plus breads and desserts all made in house. If the Lakehouse is a bright, airy, and summery home, Civility and Unrest is the low-lit, moody den where you go to escape the party for a nip of scotch. Just below the Lakehouse on the street level of the hotel, this sibling cocktail lounge is hidden behind a seamless mural—feel for the door handle just to the left of a large-scale, hand-painted iPhone. You can’t miss it. Inside, find small bites and ambitious drinks. Here bartenders can experiment with modern molecular techniques applied to old-school cocktails. But yes, you can still order your old fashioned. The back bar, with its lush, aquamarine seating will be a bit loungier and host guest DJs, but this ain’t no nightclub, says Wilson. Both the Lakehouse (open from breakfast through late night) and Civility and Unrest are officially open as of June 15. Find both of Wilson’s latest Eastside spots at 10455 Northeast Fifth Place.